A brand new addition to "Usborne Young Reading Series 2", aimed at children whose reading ability is beginning to grow, building confidence and ability. 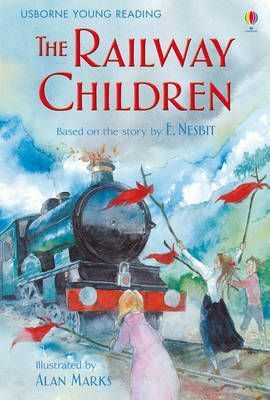 "The Railway Children" is a re-telling of the beloved E. Nesbitt story following the story of three children growing up after their father is wrongly accused of spying. A brand new addition to "Usborne Young Reading Series 2", aimed at children whose reading ability is beginning to grow, building confidence and ability. "The Railway Children" is a re-telling of the beloved E. Nesbitt story following the story of three children growing up after their father is wrongly accused of spying. It is evocatively illustrated by Alan Marks. It is developed in consultation with Alison Kelly, who is a senior lecturer in education and an early reading specialist from Roehampton University.